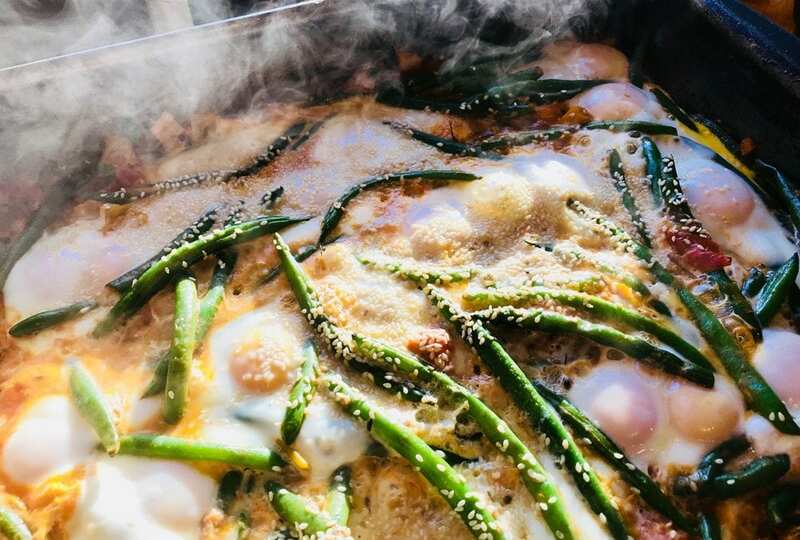 Si’s amazing spicy baked eggs with beans and toasted sesame recipe. Serves about 4. 1/4 cup x vegetable stock or filtered water. A cast iron pan, baking tray or frying pan with a heat proof handle that can go in the oven. A lid or plate to cover the pan or tray for a few moments wheel on the stove. This is a great way to share breakfast or brunch with some close friends, family or even with yourself!! Just be sure to use about 2 eggs per person. TIP: It’s so simple but important to season as you go if you would like a full flavoured meal that brings out the layers of flavour from each ingredient. So be sure to add a little pinch of salt during each stage when adding the ingredients. All ovens and eggs aren’t created equal, so use the time frame mentioned as a guideline. Be sure to check your eggs after about 10 minutes to see how they cooking and remove them just before the whites are fully cooked as they will finish with the residual heat from the pan. Warm a pan or baking try on medium heat & add your olive oil with the garlic in it for a few moments. When it is sizzling gently add your leeks, fennel seeds, coriander seeds, chopped parsley stalks and sauté for another 5 or so minutes or until your leeks are soft and translucent. Add your capsicums and sauté for a few minutes until they soften a little and then add your tomatoes and paprika. Continue to sauté for another 5-10 minutes on medium-low heat or until your tomatoes are partly broken down and creating a light sauce. Now add your stock/water and green beans and cover for 3-5 minutes to gently steam the beans a little. While this is happening, crack your eggs into a bowl and wait. When your beans a vibrant green and slightly softer, add your spinach, basil and parsley. Stir through well. Pour your eggs in carefully and sprinkle with salt and sesame seeds. Continue to cook on stove until little bubbles first appear in the eggs and then Finnish in the oven. Be sure to check on them every 10 minutes or so to ensure they are cooked to your liking. Place in the middle of the table simply with some toasted sourdough and if you have some do the following laying around, they are also a great addition. Zesty almond and basil pesto (Recipe is here in our blog) fresh avocados, sauerkraut, and Chili.